Modern games consoles allow the user to connect to the internet but each one has different parental control options. • The Sony PSP and the Sony Playstation 3 allow parents to restrict the types of games that can be played and downloaded, as well as controlling video media that can be watched. • The Nintendo Wii provides parental controls for internet use and game playing. Age ratings are used to restrict game playing settings, these can be adjusted to the appropriate rating for your children. If you connect the Wii to the internet you can use and also control sending and receiving messages. • The Nintendo DS and DS Lite both use a PIN (Personal Identification Number) so that parents and guardians can control downloading and photo sharing. • The Microsoft Xbox 360 provides family settings to restrict the types of films that children can view and games that they can play based on content ratings. It also gives control of the types of use carried out on Xbox Live. Consoles are set to allow full access in default so it is important to set the console to the relevant rating for your child. Many media players use Windows Media Player to play video material. The Windows Media Player programme has built-in parental controls that allow the ratings to be set for certain videos. 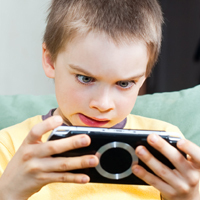 Recent research carried out by Ofcom found that 22 per cent of children say that they were not sure what they should do if they came across inappropriate material on their games console. As a parent, you should encourage your children to tell you about anything they have seen or heard that has made them feel uncomfortable. If you come across content online that you think might be illegal, there are two things you can do. Firstly, report it to the Internet Watch Foundation (IWF), some sites may provide a direct link to the IWF or you can use the link below. Secondly, report the content to your internet service provider.